Life is good for trainer Antonio Sano. Last week, he became a U.S. citizen, and this week, at his adopted home track, he will saddle one of the horses to beat in the Grade 1, $9 million Pegasus World Cup. Twice kidnapped for ransom in his native Venezuela, Sano made it to America back in 2009, and seven years later he debuted Gunnevera, a son of Dialed In, who he picked out as a yearling. Three years and more than $4 million in earnings later, the horse he describes as "once in a lifetime" will look to validate his trainer's faith in him in America's richest race. Coming off a strong second to Accelerate in the Breeders' Cup Classic, Gunnevera will meet that one and 10 others in Saturday's big race at Gulfstream Park. 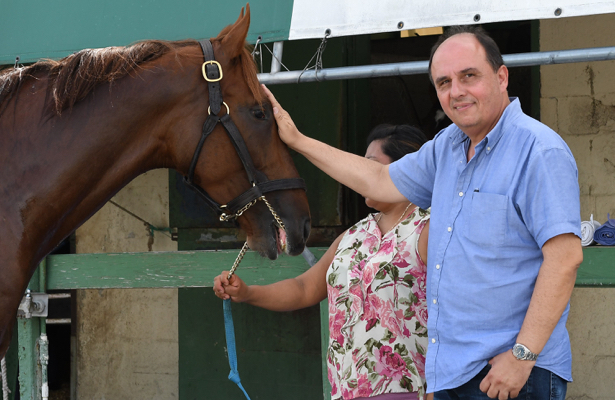 I had the opportunity to ask Venezuela's all-time winningest trainer about his star pupil, and this is what Sano had to say on all things Gunnevera. Let's start at the beginning … Off a maiden win at Gulfstream Park, you showed plenty of confidence in Gunnevera by sending him up to Saratoga for a grade 2 stakes race, which he won. How early did you know you had a good one? Out of the pool of yearlings that I purchased in the fall of 2015, he was the one that stood out the most. At the time of training both in Ocala and on the track at Gulfstream Park West, he had a magnificent stride and class. Even before his debut race, I had Kentucky Derby inspirations with him. I was happy he proved me right. In your heart, where does the Pegasus World Cup compare to winning say a Kentucky Derby, Breeders' Cup Classic, or Dubai World Cup? The Pegasus World Cup is extremely significant to me. It's run in my backyard, and it gives a sensation of being the “home” team. Gulfstream Park was where my training career in the United States started, and it has opened the doors to many wonderful opportunities. This race would be giving Gunnevera his first Grade 1 win, which I believe he immensely deserves. How is he coming up to the big race? How about compared to the same race last year? He has been training phenomenal, and has showed me that he still has talent in him that we haven’t seen yet. I believe we haven’t seen him peak yet. Compared to last year’s race, Gunnevera today is a more mature horse both mentally and physically, while also having more experience in the handicap division. The Pegasus is a furlong shorter than the Breeders' Cup Classic. Do you see this as an advantage or disadvantage for your late-running star? He has won at Gulfstream Park many times, and at distances going from 5 1/2 furlongs to 1 1/16 miles. Distance won’t be an issue or disadvantage for him. Is there any horse which you most fear in the Pegasus field? My horse is training amazing, and I believe he will improve even more from that second place in the Breeders' Cup Classic. But, I still believe that the horse to beat would be Accelerate, since he has proven himself in the past, and is also a contender for Horse of the Year. Nevertheless, there are 12 horses in the race, and every single one of them has a chance to win. If they made it this far, it is because they are very special horses. Was his last race in the Breeders' Cup Classic his best yet? Was there a point in the race where you thought he might get up for the win? The way he is training up for the Pegasus has showed me that he hasn’t peaked yet. I was very satisfied with all his breezes. In the Breeders' Cup Classic, I told my wife and my kids at the 3/8th pole that we had won the race. The manner he was closing the race reminded of his Saratoga Special win in 2016. Unfortunately, there was a lot of traffic in the stretch and we were only a length away from winning. After the Pegasus, what major goals will Gunnevera have in 2019? We are expecting a big effort from him in the Pegasus, then we will continue with the plan of racing him all of 2019. The Dubai World Cup is a very possible start. After that we will campaign him at Saratoga, and finalize the year with the Breeders' Cup Classic. Where does Gunnevera compare to the best horses you've trained or worked with? Prior to Gunnevera the best horse that I trained was a filly named Queen Blue. With only two starts under her belt, she managed to participate and sweep the fillies Triple Crown in Valencia, Venezuela, winning the Horse of the Year award. But Gunnevera is a once in a lifetime type of horse. 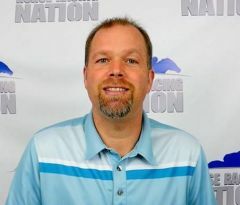 He is giving me and the barn satisfaction and successes throughout the years. He is taking me to places every trainer would love to go and giving me an enormous amount of excitement every time he runs. I would say that waking up at 4:00 in the morning every day, and knowing that I will be training one of the nation’s best horses, is definitely a motivation. He's won several stakes and run well in many of America's biggest races. How much would it mean to you to get Gunnevera that elusive Grade 1 win? It would mean a lot to me, since he tries with all his heart every single time he runs, and never gives up, regardless of how tough the spot he is competing in. He already has three seconds and two thirds in Grade 1 races, and has beaten more than 20 Grade 1 winners. I truly believe he deserves that Grade 1 victory, and I know he is very close to attaining it.